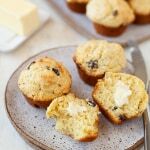 These Irish soda bread muffins are an Irish girl’s DREAM. Imagine the flavor of Irish soda bread with the fluffy texture of a muffin. This recipe is perfect to have around for breakfast, especially during St. Patrick’s Day weekend! Preheat oven to 375 degrees F. Add liners to muffin pan or generously spray with baking spray. In a large bowl mix together flour, sugar, baking powder, baking soda, salt, and caraway seeds until combined. In a medium bowl, whisk buttermilk, egg, and butter until combined. Add wet ingredients to dry and gently mix until just moistened (do not overmix). Gently fold in raisins. Spoon batter (about 1/3 cup) into each well. Bake at 375 degrees F for about 20 minutes, or until toothpick inserted into center comes out clean. Let cool for 5 minutes before removing from pan onto wire rack to cool further. Serve warm with butter and/or jam.